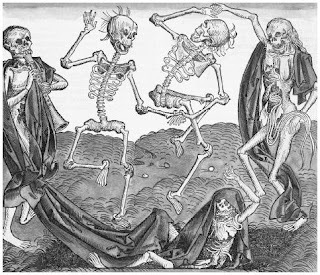 Today I acknowledge the Día de los Muertos (November 2nd) with a few words on Danse Macabre (Dance of the Dead) by the German Medieval artist Michael Wolmegut. As soon as I saw this print it reminded me of the Mexican Day of the Dead where deceased loved-ones are remembered and celebrated, often with colorful folk art, candy, and revelry. The holiday is timed with the Catholic holiday All Soul's Day, although much in the way it is observed can be traced to a pagan Aztec holiday that goes back thousands of years. Wolmegut's print was not inspired by death in the general sense, but rather the Black Death that terrorized Europe for most of the 14th century. The fear, grief, and outright madness that afflicted plagued communities is unimaginable. It is estimated that as much as 60% of the European population was killed off. In the face of so much sudden, mysterious, and unstoppable death, it is no wonder that artists like Wolmegut created images making light of death. The connection between the Mexican holiday and Wolmegut's print is obvious; in this picture skeletons play instruments and dance with seeming joy. It can be interpreted in a cynical manner, the ultimate triumph of death over life. But it also brings some levity to the often depressing but inescapable truth that we all die. Laden with that awareness, hopefully we can make the most of our brief lives, and live them as colorfully as the Mexican people celebrate the lives of their dead. Image is 8" x 10", paper is 11" x 14"
She grows out of each size so fast. Which sits too high on the bookshelf for her to reach. Up and down, up and down, just as "the children on the bus go." Spinning metal teeth are doing to her sweet potatoes and green beans. People have stopped asking "Does she sleep through the night?" She used to dive off the bed and couch head first and we would catch her. Now she rolls onto her tummy and dangles her legs off the edge. One is quite graceful, and I almost expect something more to happen. Like maybe she'll put her arms out, smile like Marilyn, and say, "Tada!" 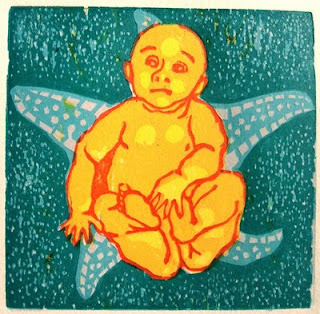 Kirsten Francis is a printmaker who frequently creates color reduction woodcuts (a time consuming and physically demanding process) such as this one. 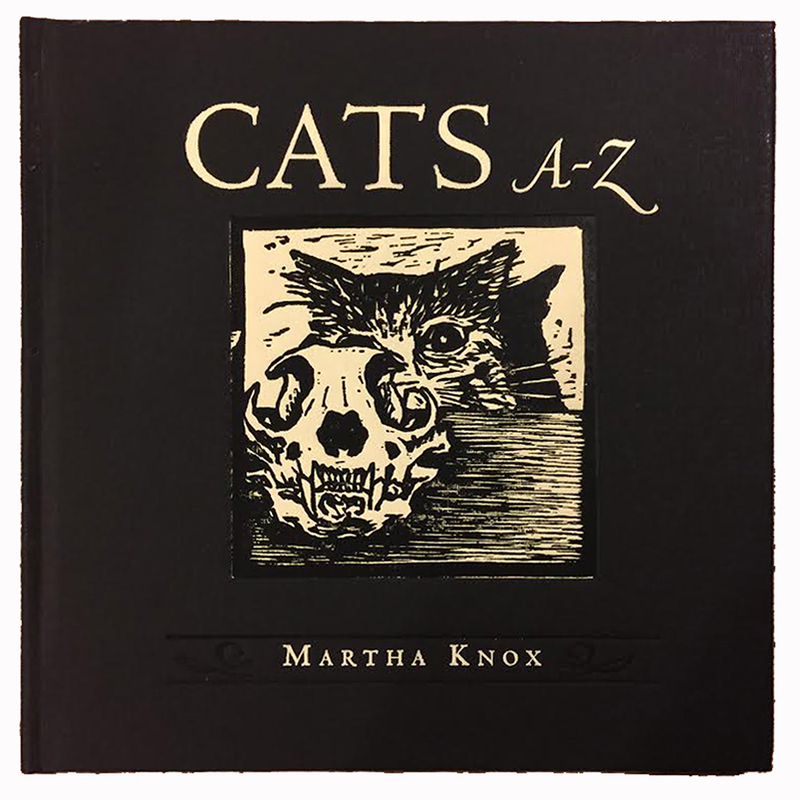 Learn more about her work (and better yet, buy some) at her website. Much of Francis's images are allegorical, and this one is no exception. 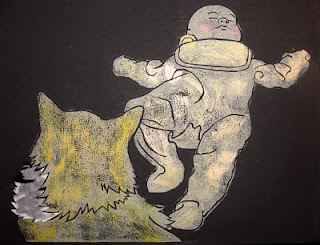 The thing with allegories in visual artwork is that artists can only get away with them if they have enough mastery over their medium to convince viewers to take the image by itself seriously. Francis does. 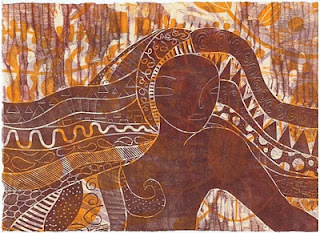 Like all of her woodcuts, this image is packed with excruciatingly delicate marks that give the image depth and movement. There are just enough carving marks left around the figures to suggest motion. Variety of textures give the various surfaces (cloth, feathers, fur, skin) each their own feel. And some of the areas of color remind me of Seurat's stippling. I believe there is a body under this woman's clothing, and muscles and bones beneath her skin. I can hear the flapping of the raven's wings in my mind. I feel the weight of that cat. The compositional placement of all the figures and objects as well as the pose and posture of the woman are believable. I imagine the woman's grip and muscles tightening in anticipation of the bird on the pole lifting off, causing the cat to perhaps leap off the pole itself, which would then require a rapid double compensation for the changes in weight distribution. And that's only one possible sequence of events. 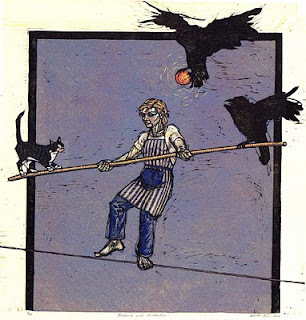 Of course this image is not literally about a woman on a tightrope. But that literal image must be convincing for me to take the allegory seriously. And I do take it seriously. The image is about what it feels like to balance many interrelated objectives in life. It's easy to lose our balance if we have too much going on: get passed over for a promotion, miss too many of a child's softball games, take out all our stress on a spouse, neglect health problems, etc. Making a living, maintaining healthy relationships, and achieving personal fulfillment is a tall order, but everyone is trying to do it. If something finally goes out of balance, a fall can happen quickly: loss of a crucial job, a death in the family... But clearly the woman on the tightrope is not thinking about these possibilities. Her body shows she's moving in response all the weight changes that are out of her control and her facial expression shows calm concentration. This delicate dance takes all of her focus. She can't worry about falling and do her best to prevent it at the same time. 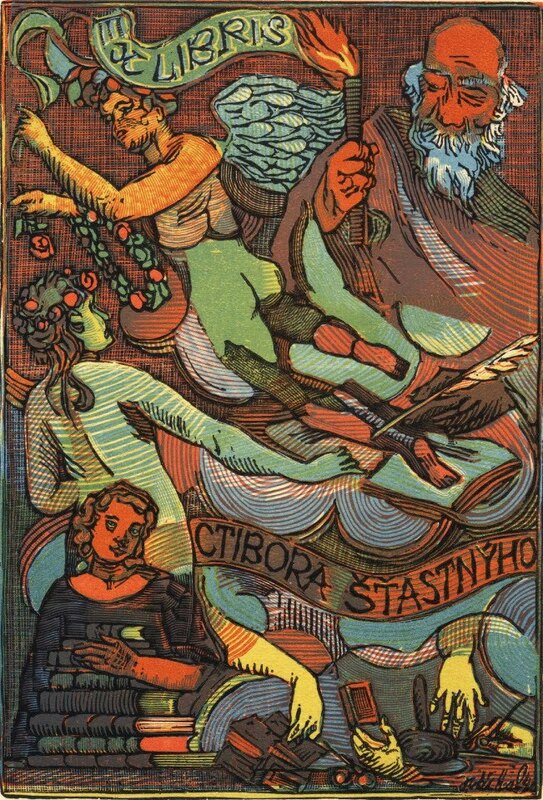 I've recently discovered the amazing woodcuts and other prints and paintings of Josef Vachal. I first came upon his work on this blog, and later found out more about him on this website. 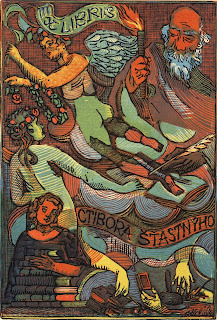 This is from Vachal's Ex Libris woodcuts and depicts Ctibora Šťastnýho, an artist and teacher in Bzenec contemporary with Vachal. When I look at this image, I feel a passion for knowledge and an exploration of the mind's eye. Books clutter the bottom of the page and hands are everywhere moving, staking, opening, and writing. The positions of heads and gestures of the three figures to the left swiftly guide my gaze up and around. The dynamism of the composition is greatly intensified by the sudden color changes, stripes and swirls of texture. Everything moves up counter clockwise in a great wave. Information and the human response to it build up on themselves until they reach the pinnacle: a great, upright torch lighting the flowing "Ex Libris" sign. Šťastnýho holds the torch. His face is calm, eyes closed in concentration. The direction of the piece then gracefully slides down across his chest, into his hand and feathered pen. But it doesn't rest there. Just as the pen needs to be replenished with ink, the artist's mind must be replenished with more information and experience. And so gravity pulls the eye downward, back to the books, to begin the cycle over again. This isn't like most of my other work; there are areas where part of the imagery starts to fade because the background and foreground colors are so similar (the bottom of the white wings and the butterflies at the bottom of the image.) Also, the two main foreground characters are integrated into the background by the highlights which read more like cutouts. For these reasons the picture also has a more psychedelic feel to it. 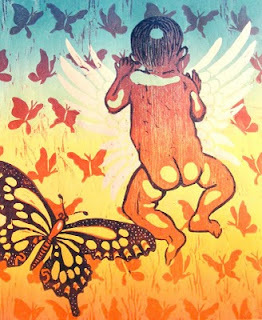 I imagine putting my fingers through the holes in the butterfly and baby; peering into those holes to find, perhaps, a parallel universe that is similar to but not quite reality. Nothing in the image is substantial. Everything is fading in and out like the Cheshire Cat from Alice's Adventures in Wonderland. It's all in the lighting, like when a black cat slips into the shadows and disappears. Sometimes the sun is so bright in my eyes that everything starts to fade into a blurry mess of yellow and white. All the imagery here appears especially flat, like paper dolls but thinner. More like tissue paper dolls. So easy to crumple up and toss away. Lighter than air. Floating up like a helium balloon but slower and softer. Soon out of reach. Eventually out of sight, forever. Image reposted with permission by the artist. 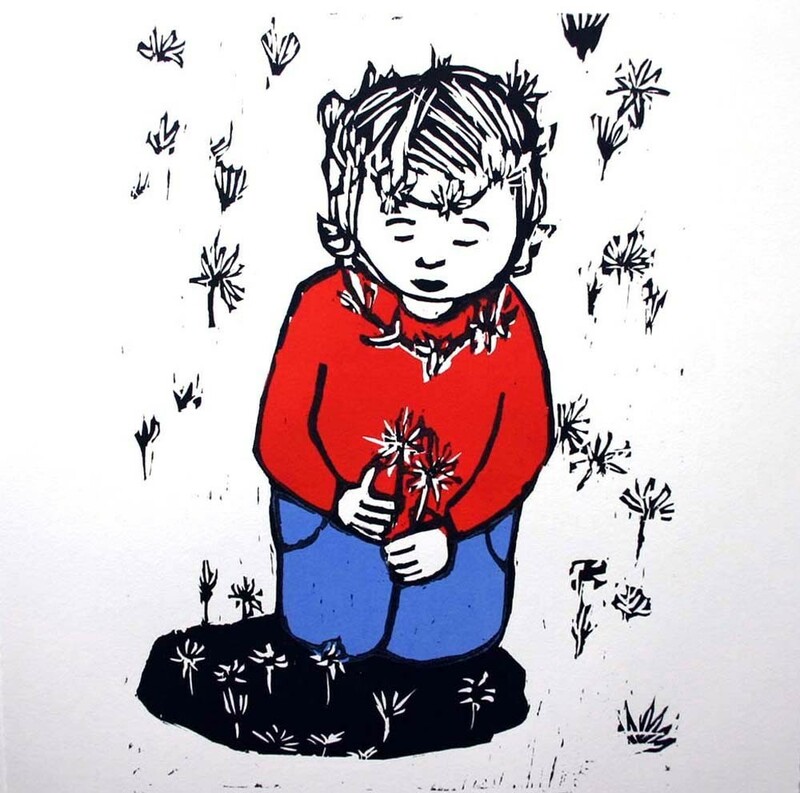 More of Fleur Rendell's work can be found here. I love images that represent a sensible, mundane scene in a way easily interpreted as fantastical. White daisies, black stems, an array of flat gestures on a blanket of snow. Seasons mesh, time compresses. The unpicked daisies float free. They parachute down from the sky all around this giant child like dandelion seeds. As for those harvested, cloddish fingers thread and transform those innocent flowers into fragile jewelry, which will turn limp and brown soon enough. 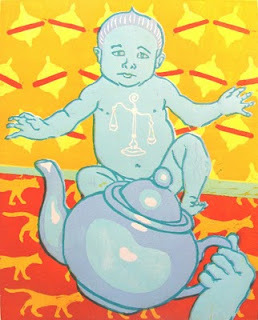 The child's expression is serene and methodical, her whole body focused on her task. 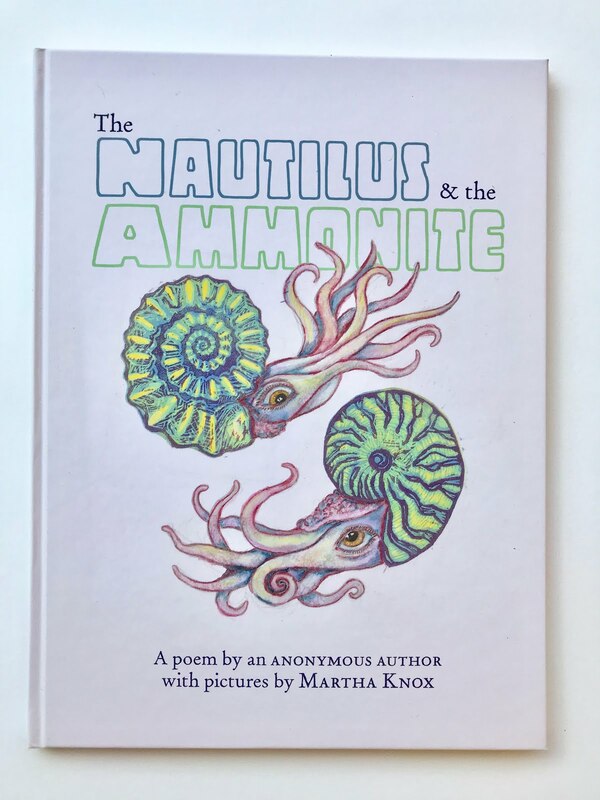 She kneels down in a puddle of ink, which also reads like a hole into which she could climb. Primary colors red and blue scream, more solid than anything else. More permanent. More real? Everything else will pass away quickly: the flowers, the child, the light on the ground. Enjoy the light now. Hold tight as we enter the darkness. This image is considered one of the great masterpieces of the last master of Ukiyo-e in the history of Japanese art: Tsukioka Yoshitoshi. It is from his series One Hundred Aspects of the Moon. 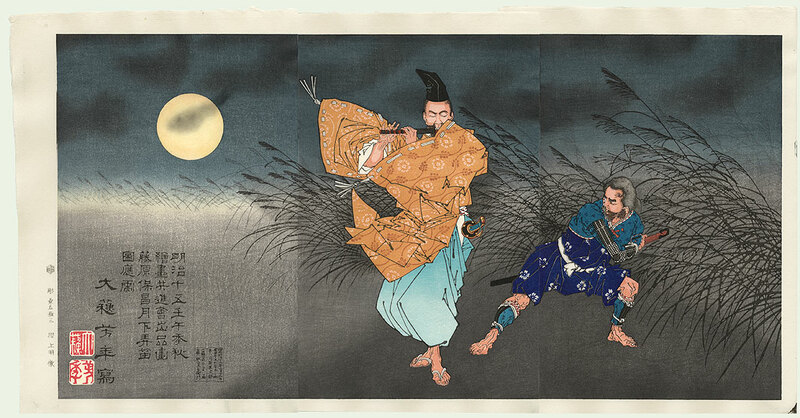 This particular image illustrates the tale of a bandit who intended to attack and rob the flutist Fujiwara no Yasumasa. However, the flutist's playing so captivated the bandit that he followed him home where the Yasumasa gave his would-be attacker a new set of clothing. Yoshitoshi's works date to the late 1800's, but many look like modern-day illustrations. 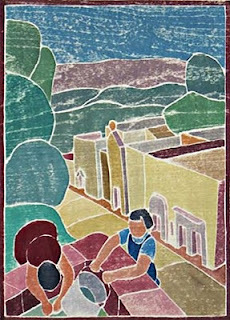 He was an incredible innovator, both influenced by outside art and devoted to the traditional Japanese craft of woodcuts. His images stand out not only for their masterful use of color and gradations, but the dynamic and expressive postures of his characters. Even the setting seems to move. 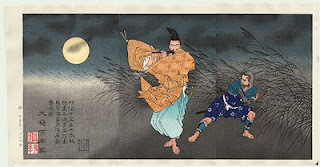 Though the two figures technically float, shadowless on top of their environment, the shape and direction of their limbs and clothing so echoes the angle of the horizon, clouds, and reeds, I can practically hear the sound of the flute on the wind and feel a cool breeze. Though it is a elegantly balanced triptych, this image is anything but still. Yoshitoshi must have worked fast to produce so much high caliber work in his lifetime. Maybe he felt a sense of urgency given the fast rate at which technology and his own society and culture transformed around him. Maybe that is why so many of his images have a ferocious sense of movement. The environment around the flutist pushes and pulses with motion, and the bandit is poised to strike. But the flutist stands perfectly upright in the center of a triptych, pulling my gaze to him just as his music drew the bandit to his home. In the tale his music compels the bandit to stop, and listen! Here, I feel commanded to stop, and look! Hopefully tomorrow I'll step out into the world and be of a mind to continue this practice without need of the command. This is really just an artist's proof. 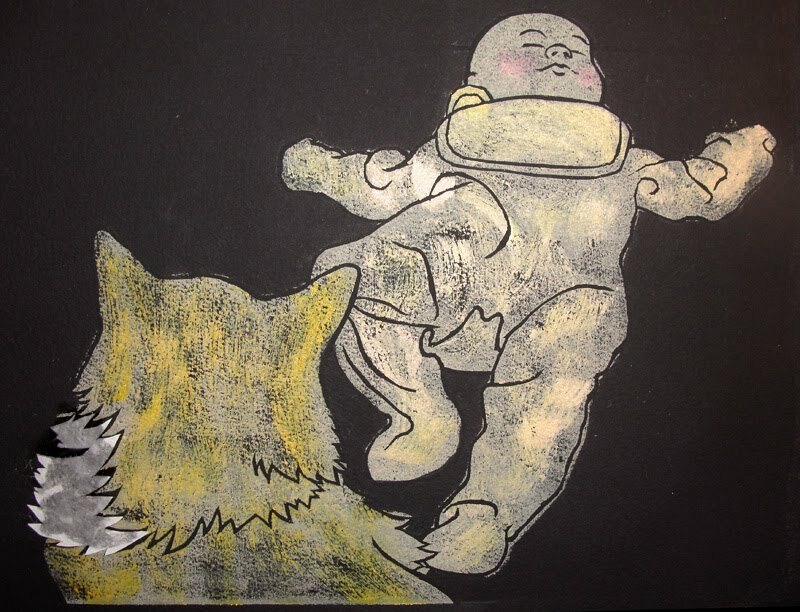 I carved the line drawing and printed the baby and cat, but there is a background too. I enjoyed how they looked on just the black paper, so I left this image without the printed background. Will print more versions soon. 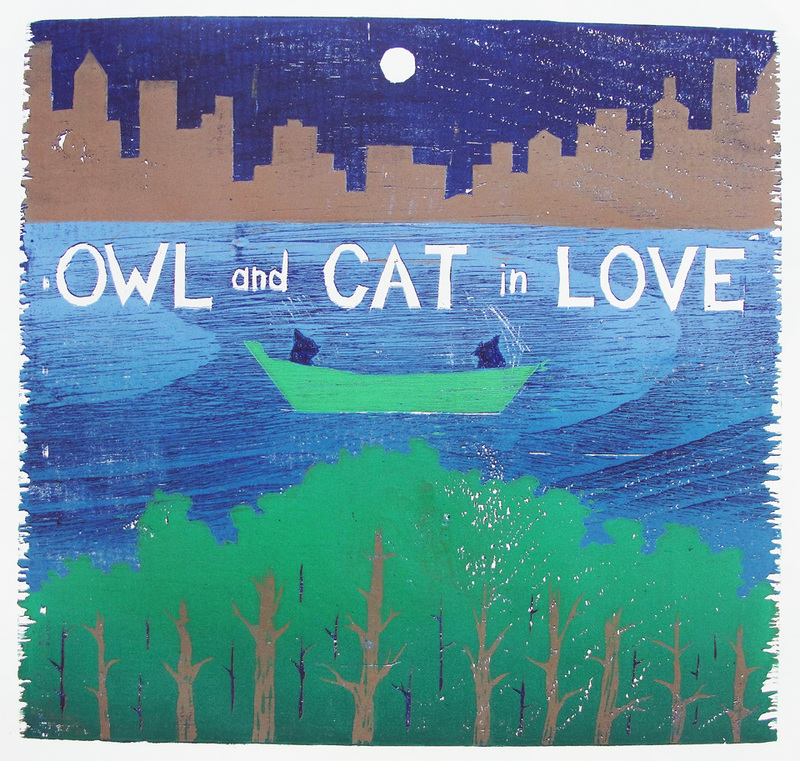 The image is a nine color wood block print, which measures 22 x 28" inches. 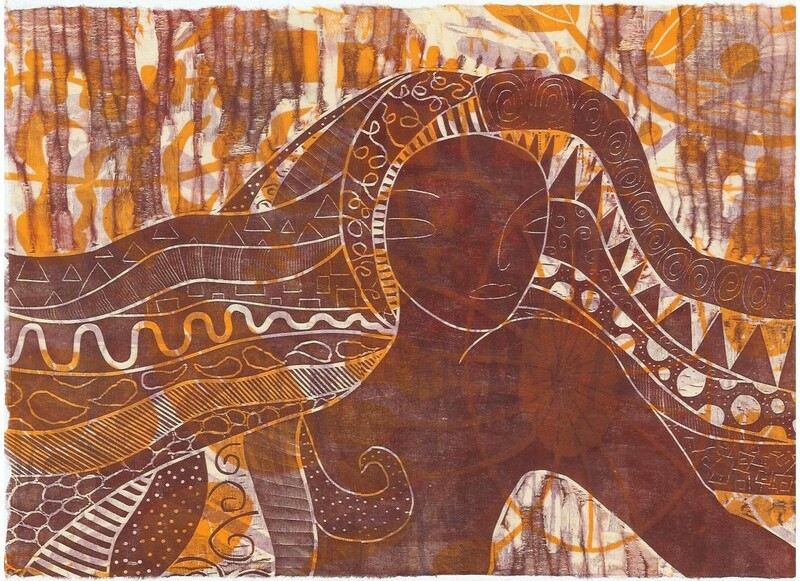 The artist, Helen Gotlib, has a website here, and an online store here. Immediately I recognized part of a face near the center. A feminine brow, cheek, and closed eye. But as my gaze moved outward, all logical assumptions were thwarted. Where I thought there would be a shoulder faded into dark, blue mist. The place I expected a hand appeared more like seeds and straw taken up in a great gust of wind. I looked closer and what I took to be hair, an ear, and part of a nose became increasingly abstract. Twigs seemed to be stuck in or growing out of the ear and head in odd places and directions, and a curly lock which stopped and started again in a strange fashion obscured the nose. I began to wonder if I was looking at an anthropomorphized landscape. Perhaps this face was meant to represent one of the ancestral spirit beings from the Aboriginal Dreamtime. But, no, the links to landscape are mere visual suggestions. That feminine brow, cheek, and closed eye are clear. More than anything else, this is the image of a girl's face. It's just that the image only comes together when viewed as a whole. Trying to make sense of the details and edges leads to dead ends because the image in its entirety is one grand sweep. I have come to interpret this image as the girl caught in the midst of a dream. Dreams take us outside of ourselves. We can be anyone or anything else. Dreams present experiences that seem as real as reality but which can defy the laws of physics and logic without questions or even funny looks. Dreams don't have to make sense, and very often they don't. After waking, we forget all the details, and sometimes even the overall impressions. They are difficult to describe to others. Dreams are a domain of feeling and intuition. There, something can seem incredibly profound merely because we feel its importance, not because it possesses any explainable merits. This print reminds me of both dreams and Mark Rothko paintings in this sense: I instantly felt the profundity of this image and continue to feel it after considerably more looking and thinking. But I still can't explain why. This picture is so lyrical, particularly for a woodcut. It reminds me of the most voluptuous of Indian figural sculptures because here the artist has taken a rigid substance (wood, stone, or bronze) and carved into something curved and which implies soft surfaces and rapid yet delicate movements. This is unsurprising coming from Derain, one of the founders of Fauvism. Salome's hair and dress bunch and tumble back as her legs push off the ground and kick forward. One hand seems to hold the onlooker off as the other beckons. Bracelets and anklets seem to spin round, echoing the flurry of movement in the hair and dress. One aspect of this image at first seemed distinctly unlike Fauvism to me: the restrained use of color. But while these colors are not as typically vivid as familiar Fauvist works, they are unnatural and expressive. 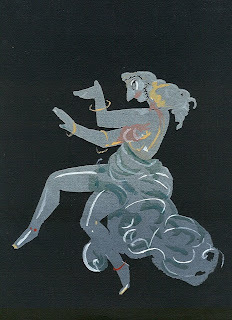 Salome's intentions are cold, after all well-suited to the grey that dominates the figure and sharply pops out from the pitch black background. The exaggeration of the nose and eyes with the curly, black line down the side of her jaw to me imply a mask, although there is no mention of Salome wearing a mask during her dance for King Herod, nor can I find any references to masks in cultural references to the Salome myth. Perhaps the curly line is simply a line of hair, and the indelicate, bird-like features are meant to signify the wicked intentions of the Biblical seductress. I still read it as a mask. She seems a body playing a part - entertaining. Only a lovely, fast, and distracting surface appears for her audience. Her true depth remains unveiled. She floats and glows under a spotlight in the center with a quizzical expression on her face. Fingers splayed as if she's maintaining balance after a bit of a shock. The starfish dances behind her like wings. Fizz and bubbles all around. The wings and the bubbles help keep her afloat. At least until the spotlight moves on. This original print is for sale here. All things arise,suffer change,and pass away.This is their nature.When you know this nothing perturbs you, nothing hurts you.You become still. It is easy. 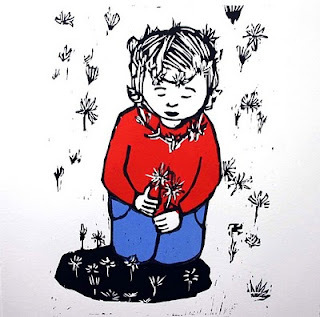 This is my favorite work by one of my favorite contemporary woodcut printmakers, Marissa Swinghammer, or M. Lee. Her art blog can be found here, and her Etsy store can be found here. The print measures 15"x11" - a humble size for an image that contains cosmic contemplations. 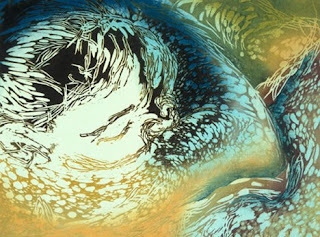 M. Lee is a master of layered, color woodcuts. All of her prints emphasize the grain and natural texture of the wood in translucent layers of color, and the stunning final products lyrically move the eye around and possess an ethereal quality. Perhaps this is why this image of Kali is my favorite. Kali is the Hindu Goddess of destruction. Not destruction in the sense of angry or mindless demolition, but in the sense that all things in life are transient. The Goddess's flowing hair seems to move in front of a background teeming with life in the throws of death - falling yellow leaves, faded bark... The wide variety of organic marks contained in her locks remind me of layers of sediment, layers of time recording generation upon generation of organisms. Her eyes and arms both stretch in opposite directions, rigorously moving forward while reaching back. Though we can see through her, the Goddess is bold and determined. Her work presses on, eternal. The first thing that gets me about this image is that the two women gathering water seem to be dramatically high above the road and buildings, as if there is a steep drop just behind them. Perhaps the buildings aren't sized to life.This fits with the way they are drawn: simplified planes of pastel color and lines that bend and waver instead of stand up straight. These buildings remind me more of a toy block city or cardboard model than real architecture. The people themselves appear quite like stiff models, too. Thick-armed, faceless, and getting right down to their work, they blend into their wooden surroundings. Round, green forms representing trees rise up from the figure on the left, continuing the caterpillar-like chain of segments that begins with the back of her head. The line of the sidewalk cuts across the shape of the woman on the right causing her blue clothing to stand out while making the flesh of her face and arms blends in even more with the warm-colored stone around the well and ground between the sidewalk and buildings. 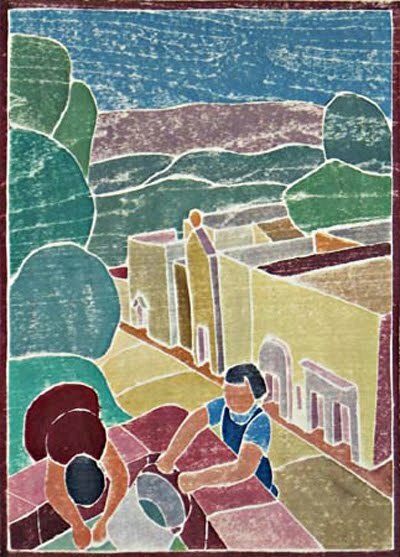 The visual connection to toys and models is furthered by the thin brown frame around the entire image and the woodgrain emphasized evenly across the sky and far away landscape. What would be miles of distance collapse into a very flat picture, resembling a wooden puzzle. I am reminded of traditional American folk art, toys still created by and used by the Amish and Waldorf schools. Objects that directly connect to a simple way of life because of what they are made of, as well as what they are. Playthings so plain that most of the game is left up to the child's imagination. There is an exhibit of this artist's work, Midwest Modern: The Color Woodcuts of Mabel Hewit, at the Cleveland Museum of Art, on display through October 24th. Click here for more details.